The need to play or otherwise be active applies to adults as well, including people affected with dementia. The activity, the stimulation, a sense of accomplishment that often goes along with play; all these are beneficial and therapeutic. Toys for people with Alzheimer’s don’t look very different than any other toys. However, it is not inappropriate to give toys to people with Alzheimer’s. They might not be aware of the benefit they are getting from the play, but if you watch them I think you will see it. When we select toys for children, the stage of the child’s development is the biggest factor in making a choice. We don’t bring home a rocking horse for an infant. A 100 piece puzzle is inappropriate for a toddler. And a rattle is not the thing to get for your primary school student. In a similar manner, when we select a toy for a person with Alzheimer’s we have to consider the abilities of that individual. Cognitive as well as social abilities and perceptual acuity are lost to the inevitable spread through the brain of the plaques and tangles that probably caused the disease. We like to think about it in this way: as the disease progresses, the person with Alzheimer’s regains those childlike (not childish) qualities that make children see their world as a magical place. Everything is new for children since they do not have much of a past. In the same way, the world of the person with Alzheimer’s can be full of novelty since he is losing his past to the disease. Without the past of his memories, without the future of his expectations, he is alive in the present. This box full of colorful balls is one of the early toys we brought to Bernice. She had broken her wrist and the cast had been removed recently. She was reluctant to do anything that was even moderately therapeutic to get back the use of her arm and hand. When we first sat down with her new toy, she was very tired; her speech was soft and mostly incoherent. It was afternoon (not late), and she did tire easily, but that was her go-to excuse when she was unsure. Once she got started she was fascinated. Thirty-five minutes later we had to put them away. She was no longer tired, and she was much more conversational than when we had started. And even she recognized the benefit squeezing these balls had for her mending arm. Almost any toy that the person with Alzheimer’s is interested in will be beneficial. Most toys will be effective for more than one purpose. 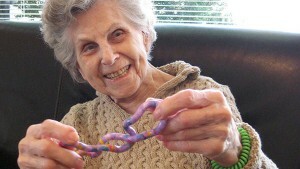 The Tangle featured on this page, invented for a broader audience, is a perfect toy for people with Alzheimer’s. It is manipulative. Twisting and turning the jointed sections provides exercise for the hands and arms at the same time that it is relaxing, almost meditative. The bright colors and varied textures of each segment provide sensory stimulation. 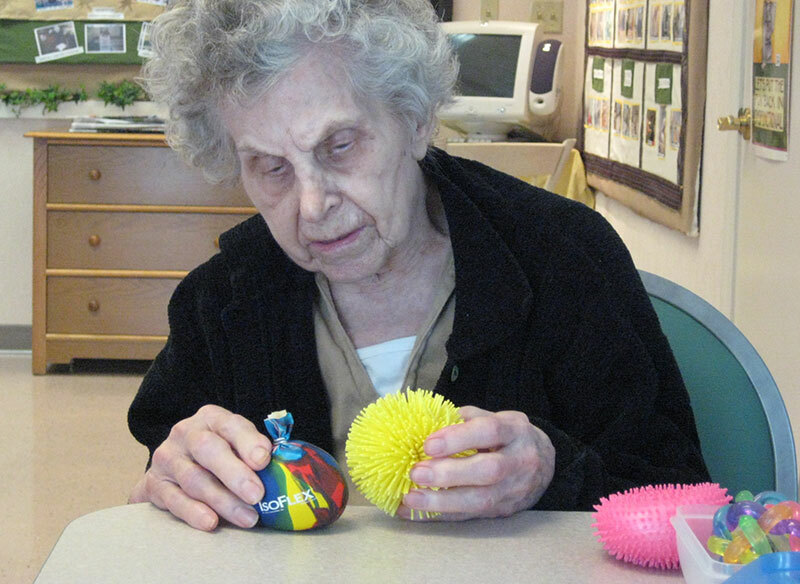 This Playable Art Ball is a stimulating toy that is age-appropriate for people with Alzheimer’s. Probably more than with any other recommendation for Alzheimer’s care, the concern will be raised here about the appropriateness of using toys in treatment, or perhaps of particular toys. This concern is understandable. It is difficult to watch a loved one regress into a childlike state. Unfortunately, that is what is happening. That person’s interests and abilities are changing. The arguments in favor of toys as therapy center around the patient. 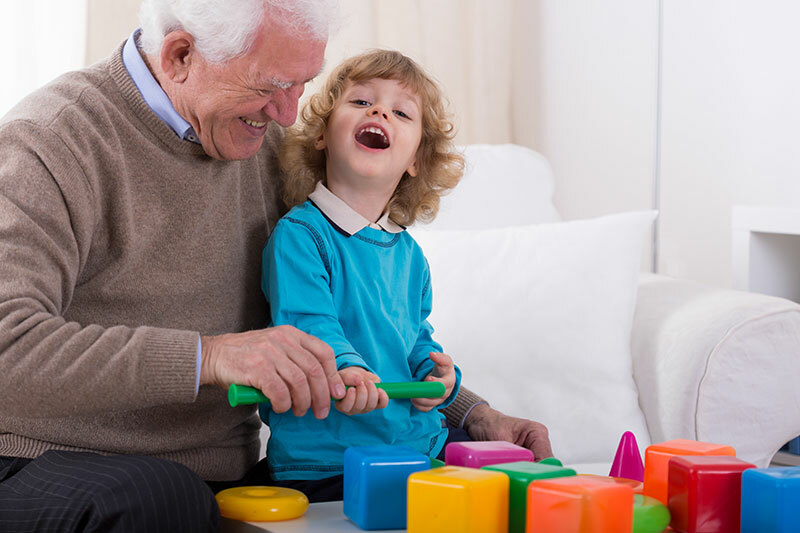 It is our firm conviction that stage-appropriate activities, including toys, enhance the quality of life of persons with dementia.The only really valid criterion for rejecting a toy or activity is if the person in your care objects to that particular toy. Alison Mahoney at the Macquarie University, in Sydney, Australia reported that stage-appropriate activities are significantly more effective in bringing about positive outcomes than are age-appropriate activities. You can read more about her study on our Activity post; in essence it means that a toy that was designed for a child might be a better activity than an activity that was meant for a high-functioning adult. The first time Bernice ever saw a Tangle Toy® was at the dentist’s office. Holly had taken Bernice for a routine examination and gave it to her to occupy her in the waiting room. As she manipulated the toy, Bernice was particularly intrigued with the textures and colors, exploring each section of the Tangle and commenting on or describing them. Holly was particularly intrigued by the flow of creativity manipulating the Tangle inspired in Bernice. Bernice, like so many people with Alzheimer’s disease, hid things. Hiding things is, in fact, symptomatic of the disease. Also, like so many people with AD, she often forgot where she had hidden them. It is very likely that tendency of hers had something to do with her story. The great thing about toys is that the pull us into the moment. Once we get involved with a toy, our full attention is taken up with play and exploration. Anything that does that can’t help but be beneficial. The Explorer Ring was, obviously, designed and created for children, yet is one of our best selling “toys”; and whereas it may not be a stage-appropriate activity for most of us, it is certainly appropriate for anyone who gets enjoyment from it. Enjoyment translates immediately to quality of life. Jean Piaget developed perhaps the best known theory of human cognitive development. According to his theory, the human child develops through four stages, culminating in abstract reasoning. According to Piaget, play is an important part of the process of progression through these stages. Many have theorized that a person with Alzheimer’s moves backward through Piaget’s stages: Simply stated, the person with Alzheimer’s looses cognitive ability as the disease progresses. Observing someone with AD makes this idea somewhat plausible, though always remember that he is still an adult, with adult experiences and adult sensibilities. J.Thornbury suggests that not only does this model provide a means for prescribing treatment, but can be helpful in understanding the behaviors of people with Alzheimer’s and dementia, behaviors that can often be disturbing to caregivers and loved ones. There is an ever-increasing amount of anecdotal evidence reported in the news services and medical publications that dolls and stuffed animals provide comfort and often a sense of purpose to AD patients. Improved behavior, less agitation, better sleep, are all results that have been reported in programs that use these methods. 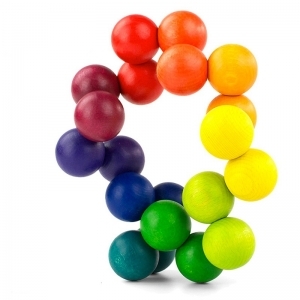 I bought the playable art ball for my father…it unfortunately pulls apart quite easily and he began putting the balls in his mouth, so would suggest that it is perhaps not the best choice or one should monitor its use very carefully. It is always a good idea to supervise activity. Thanks for the reminder. I am looking for realistic british currency for my mum. She’s always budgeted her home and now she isn’t able to keep money in hospital. Please help. hi I work for a day centre supporting adults with physical disabilities and brain injuries, it is becoming more frequent that the people attending the service have been diagnosed with dementia… I am trying to put into place activity boxes to help with the stimulation of these individuals while they attend the service and wonder if you have any ideas that could help, at present the majority of the people diagnosed are at the earlier stages of the condition but I am trying to plan ahead to give them the very best of opportunities. Any ideas would be gratefully received. thanks in advance. This is a Neurological Medical Device that stimulates the brain. Brainpaths users repeatedly trace textures on the surface of the device to stimulate the somatosensory cortex of the brain. We have games, puzzles, and activity books that would be great as well. Please let us know if you have any questions about any particular item. We’d be happy to help. Hi. My name is Sue Browning and I care for my mum who has dementia. And I’m desperately looking for something that will occupy her. Stimulate her brain. I love the look of the toy that dear Bernice has in the picture. Would there be any chance you have any of those or if you know where I could get one for her? As we are based in the US, it can be rather expensive to get something shipped to Australia, but we do ship there frequently. I am not aware if these are available in Australia. I am looking for ideas like this that I can incorporate into our hospital units with the thought of items being cleaned appropriately to reduce infections between patients. Thank you for contacting us. We have over 400 products including games, puzzles, and alternative therapies, many of which would be perfect for a hospital setting. I’m going to send you a private email with suggestions that I think would be especially good. You should also browse through the online store to see if there is anything else that appeals to you. I hope that this gives you a start. Feel free to call us with any questions. What “fidget toys” might you recommend? Thank you. I hope these suggestions will be helpful. Thanks again for visiting our site. Thanks Holly (I just thought to come back here and check for a reply…and you did so weeks ago! Thanks again. I will now buy the items you mentioned. And no, it’s not that she has food in her teeth…I’ve asked that many times….she says she’s just developed a bad habit of picking at her teeth and would give anything to stop. Hope your recommendations help. Thank you for contacting us. We are in the process of adding a “set of money”. I’ll send you an email when we have it in stock. Thank you for inquiring about activities for your dad. This website has the most comprehensive selection of ideas of any place we have found. If you are on the website and see something that you might be interested in, just click on it and you will be taken to the store where you can get more information about it. You can also click on the SHOP button in the upper right hand corner of every page. There you will find everything that is available. Please feel free to call us if you would like any more direction. We are open M-F from 8AM to 6PM Central time. Please can someone help me, I am a carer in the UK, I currently am caring for a lady who has Alzheimer’s and it is rather advanced, although she is physically mobile, sleeps through the night and eats well, she has now developed a habit of chewing things, like chewing on spoons at the meal table, cups/beekers, her fingers and nails and in the night she chews the comforters, there are now holes in the corners of her bed covers. Does anyone know why this has developed? I am worried its nerves and anxiety? Are there teething toys for them to use as she has already cracked one of her fillings. Thanks for your time, hope you can help. Kelly. Thank you for your inquiry. We receive this question quite a bit and, until recently, had not been able to find a suitable solution. We believe that we have finally found what we have been looking for. We are currently awaiting samples of the items. Please check our store (store.best-alzheimers-products.com) under New Products in a couple of weeks to see what is available. There are lots of items available on Amazon.co.uk especially for chewers. Amazon.co.uk have chewy tubes, stixx, bracelets, necklaces, chocolate flavour, lemon scented for adults.